You probably already know that they make beautiful shoes, but Loeffler Randall’s just-launched line of handbags for Fall are really something else. I’ve always been partial to more structured handbags because of their timeless appeal, but D has often teased me that the purses I’m drawn to are more suitable for little old ladies. While the Rider ($495) is admittedly boxy, the blush tone and modern hardware on it make it remarkably age appropriate – even D approved! It’s got all kinds of great features, but the best part? A slot for your iPad! Time to save up! Check out the lovely ad campaign on Refinery29. What do you think? Happy Friday! This bag is a definite WANT!!! Like right this second type of want! I love the pleats on the side from the different compartments. Adorable! 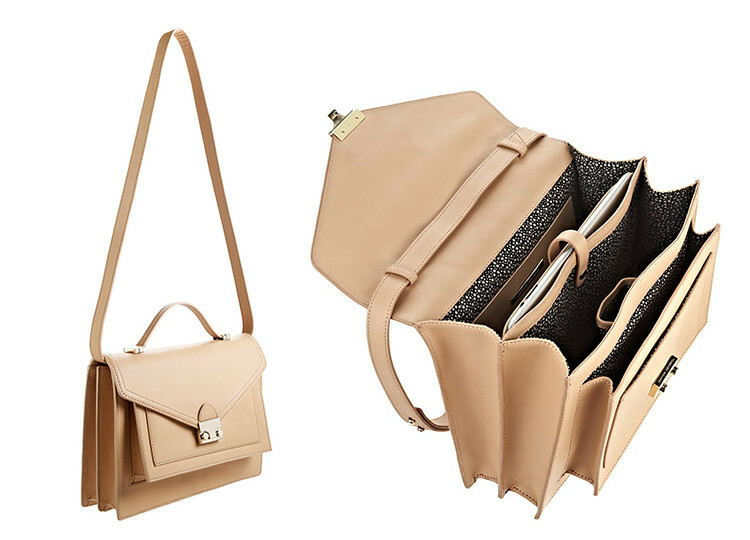 OBSESSED with Loeffler Randall’s new line of handbags – instant classic! What a beautiful bag! I love all the different sections there are. I’m sure it helps to keep everything more organized. So chic! I’m also a fan of structured purses… there’s nothing worse than when the bottom of a bag starts to sag! Love this style..thanks for sharing! Ugh, it’s stunning, and you have great taste. I love boxy bags too, and that colour is amazinnnng. I’m definitely going to check out that line!